This succulent is thought of as a useful kitchen windowsill herb—not to cook with, but to snap open should a mild burn or other mishap occur while cooking. The powdered herb also lends soothing qualities to salves, lotions and other topical preparations. Aloe ferox, a member of the Xanthorrhoeaceae family, are succulent plants formerly belonging to the Lily family, with perennial, strong and fibrous roots and numerous, persistent, fleshy leaves, proceeding from the upper part of the root, narrow, tapering, thick and fleshy, usually beset at the edges with spiny teeth. Many of the species are woody and branching. In the remote districts of S.W. Africa and in Natal, Aloes have been discovered 30 to 60 feet in height, with stems as much as 10 feet in circumference. 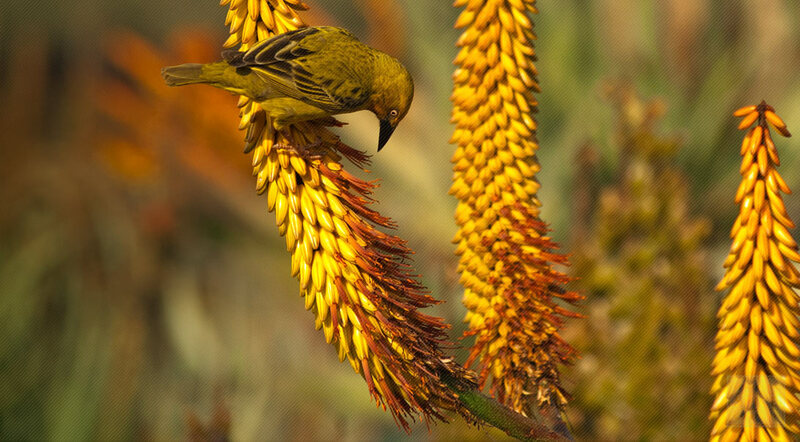 The flowers are produced in erect, terminal spikes. There is no calyx, the corolla is tubular, divided into six narrow segments at the mouth and of a red, yellow or purplish color. The capsules contain numerous angular seeds. 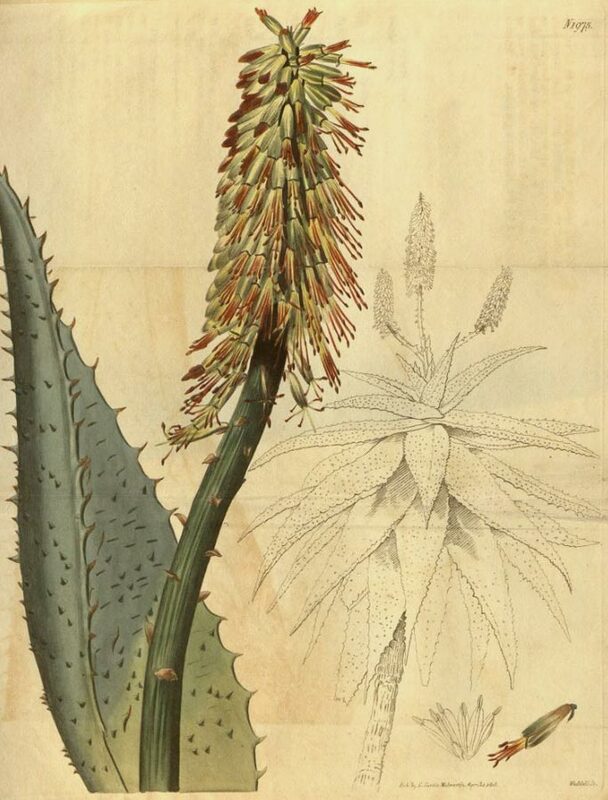 Origin of the name "Aloe" is uncertain, but some suggest that it is derived from: the Arabic 'alloch' or 'alloeh', a vernacular name for medicinally used members of the genus. Aloes are indigenous to East and South Africa, but have been introduced into the West Indies (where they are extensively cultivated) and into tropical countries, and will even flourish in the countries bordering on the Mediterranean. Aloe ferox prefers full sun, dry-tropical climates, and open areas. The plants grow best in well-drained, sandy-loamy soils with moderate watering. Aloe ferox plants are propagated mainly from seed and head cuttings, with plants sowed approximately one 3 feet apart. From seed, it takes about 4 to 5 years for the plants to reach the first harvest. The fleshy leaves of the true Aloe contain a row of fibrovascular bundles near the epidermis or outer skin. The cells of which are much enlarged and filled with a yellow juice which exudes when the leaf is cut. When aloe juice collection is desired, the leaves are cut off close to the stem and so placed that the juice is drained off into tubs. This juice thus collected is concentrated either by spontaneous evaporation, or more generally by boiling until it becomes a gel of the consistency of thick honey. On cooling, it is then poured into gourds, boxes, or similar containers. The aloe gel can be stored as a gel or it can be dried into a powder and stored in a cool, dry place. Aloe vera is a plant that’s been used for thousands of years to heal external wounds and soothe the skin. Another plant, Aloe ferox, is very similar to it. But when you go to order herbs, you may not be sure exactly what Aloe ferox, typically purchased in powder form, can do for you. Here's a rundown of some of its uses. Aloe powder is basically a dried form of aloe gel from the aloes ferox plant. The Aloe ferox plant is similar to aloe vera and is a succulent plant. The plant is native to Africa, but is cultivated in other parts of the world. You can squeeze the gel directly from the leaf or you can use a different form. It can be dried in several ways including freeze-dried or dried using a method called spray dry. The powder can then be used to create aloe juice and gels from concentrate. Once you know how much aloes ferox can do for you, you’ll be ready to stock some in your pantry immediately. Its uses are much greater than you probably imagine. It goes beyond cooling a sunburn. However, you shouldn't overlook the uses that aloe can have for the skin. Aloe can be used to soothe irritated skin. It's also an excellent moisturizer— especially if you have very sensitive skin. Some people swear by simply using aloe gel to moisturize their face every day. Legend has it that Cleopatra herself used aloe in her beauty regimen. If you have some type of burn or wound, aloe can be placed on it to help speed up the healing of the wound and keep the area moisturized. It also helps to soothe irritation that can come from insect bites and problems such as dermatitis and eczema. It's a natural way to heal your skin that doesn't contain perfumes and man made chemicals. Aloe can even be used for cold sores to help relieve their pain.